You’ll find our search box is a little more robust, and goes way beyond, your average search box. STEP 1: You’ll always find the search box at the top of every page. STEP 2: Begin typing the name or symbol, and you’ll see our search dynamically begins to list possible results. This is incredibly useful if a company spells or abbreviates its name differently than you think, or if you can only remember part of the name. In fact, you can type a few letters contained anywhere in its name, and all possibilities will show up in your search. And they are conveniently placed under industry headings for you, to avoid any confusion and get you to the exact result you were looking for. STEP 3: The search dropdown only shows the top few results in each category. So if you still don’t see what you’re looking for, click “See all results” at the bottom of the results list to be taken to a page that lists all possible results. When you get there, you’ll notice the results page shows you the number of results in each industry--and you can even click a specific industry to narrow your results down to just the one you want. STEP 4: There’s another way to narrow your search to a specific industry. At first glance, this may look like your typical search box... But look closer, and you’ll notice the word “All” just to the right of the box. That’s the default. So anything you search for will search the entire Ratings site. But if you want a more precise search, in a specific industry, all you need to do is click the word All, and you’ll see a dropdown menu with every industry we rate. 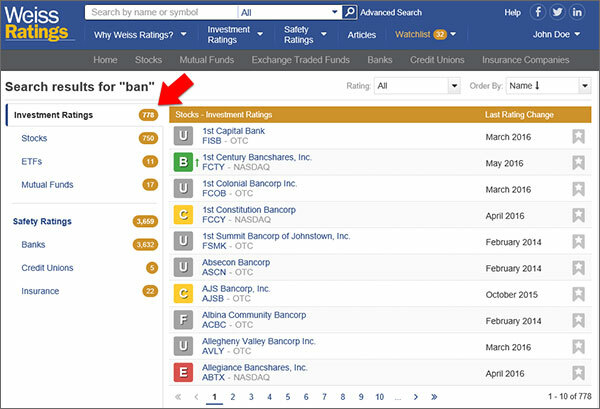 Select the one you want to search under (“Stocks” in the example below), and now when you search, you’ll only see results within that industry. 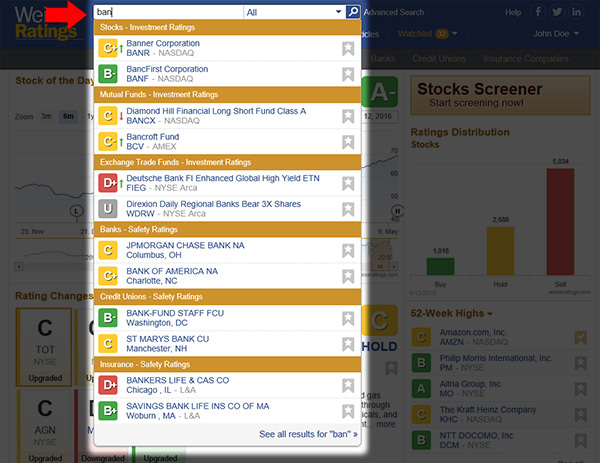 But if you want to narrow your results even faster, you can use the dropdown menu, select “stocks” for example, and zero in on the precise rating you were searching for. 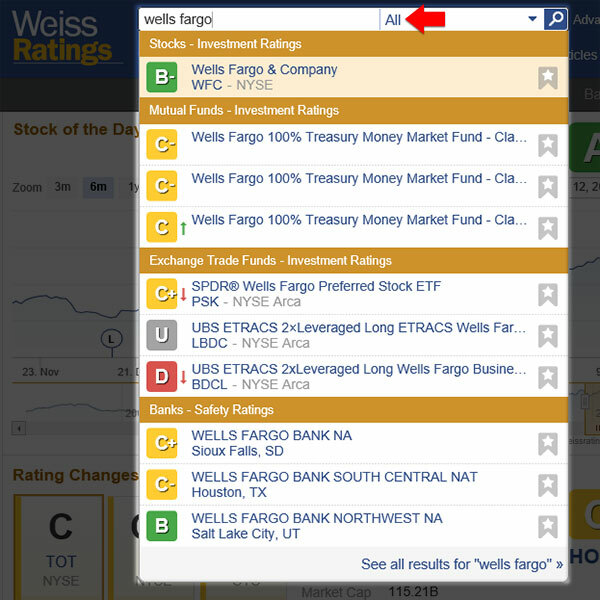 And that’s how easy it is to use our targeted search to find the companies and ratings you’re looking for, quickly.